Join us for our 2019 Bridal Showcase in our Grand Ballroom on February 20, 2019 from 5pm - 9pm! Variety of some our favorite local vendors and complimentary passed hors d'oeuvres and samples of our featured entrees! Enjoy a fun night out with your fiance, family, and friends! 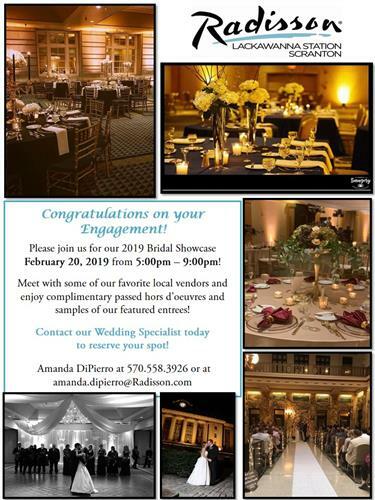 To reserve your spot, just contact our Wedding Specialist Amanda DiPierro at 570-558-3926 or amanda.dipierro@radisson.com!